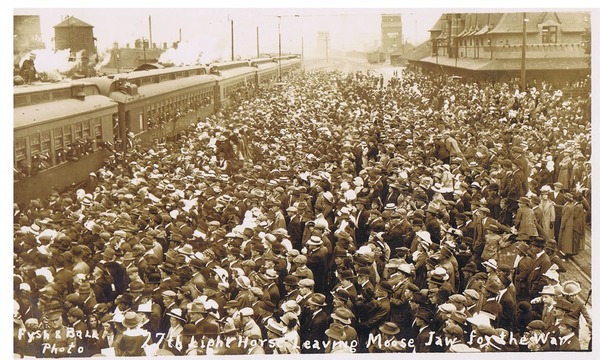 When war was announced on 4 August 1914, patriotic fervour spread across the province of Saskatchewan. Young lads headed to the local recruiting stations to sign up for a war that would be over by Christmas. British-born men made up the majority of the initial recruits, some feeling the pressure of fighting for the old country, others grabbing eagerly at the chance to see home once again. By the end of the war, over forty thousand men––including seventy nursing sisters––had served. British-born recruits found themselves alongside other ethnicities as well, one of which was arguably the most native of all Canadians––Aboriginal peoples. Recruiters appealed to the so-called ‘warrior spirit’ of these native Canadians, contradicting decades of Indian policy. As many as 137 Saskatchewan Aboriginals enlisted by the end of the war. While recruits crossed the Atlantic to the ravaged battlefields of Belgium and France, those on the Saskatchewan home front had their own roles to play in order to see the war to a successful conclusion. The Imperial Order Daughters of the Empire––called “the government’s best recruiting agents”––created handmade comforts for the soldiers, including socks, sweaters, shirts and many other gift packages. While these women knitted, sewed and cooked, the politics of Saskatchewan began to shift. Prohibition, partnered with women’s suffrage, gained significant traction during the war years. Both reform movements had been deemed premature before 1914, but the ideals and hopeful outcomes of the war gave them new life. On 1 July 1915, less than a year after the war had broke out, Premier Walter Scott announced that all drinking establishments would be closed to the public. Six months later, Scott’s government hastily revised the franchise bill, making Saskatchewan the second province to give women the vote. Democracy was not extended to all Canadians however. When war was declared, people of ‘enemy alien’ origin made up the second (German) and third (Austro-Hungarian) largest immigrant groups in Canada. By October 1914, an Order in Council had approved the process of enemy alien internment with camps being established across Canada. Some 7,700 internees found themselves in these camps during the war, many of them in Western Canada. Yet one historian has pointed out that immigrants from enemy countries were able to prosper during the war, as they contributed to the booming wartime wheat economy in Saskatchewan. By “equating patriotism with production,” farmers produced a record 224.3 million bushels of wheat––half of the country’s annual production in 1915. Patriotic production was met with high prices, reaching $2.40 per bushel in 1916. By the end of the war, Saskatchewan farmers were planting record amounts of wheat, leaving the province heavily dependent on one economic practice––agriculture. Farming became synonymous with the prairie region’s identity, and arguably continues to this day. This material has been gathered from the Brock Silversides fonds, the McKay Family fonds, the Shortt Collection of Canadiana, the photograph collection, and the pamphlet collection.